While Clone Wars saw appearances from Star Wars movie characters all the time, Rebels has been a bit less connected to the plot and characters from the original trilogy. Which is why it’s always a big event when one shows up. This month, we’re going to get to see a young Leia. 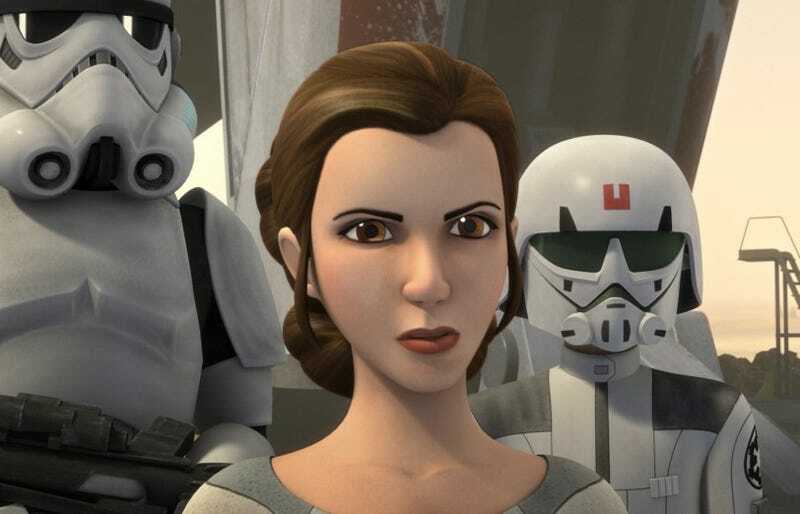 TV Insider reports that Leia’s only appearance this season will come on January 20th, when a teenage Leia goes to Lothal on a secret mission to gather ships for the Rebel fleet. The location of her mission tells us how her life intersects with that of the Ghost crew. It also tells us that Leia was trusted to do dangerous things for the Rebellion long before A New Hope. With Ahsoka, Threepio, R2-D2, Yoda, Lando, and Darth Vader all having made appearances in Rebels, who could be next? Or does it stretch credulity at a certain point for everyone to show up?